Weston s Mare/ Barry, S Wales / Weston. 27th Aug 06. Crew - myself and Ian. I had to commit to taking her out sometime - so roped in some experience in the form of Ian, a friend of my sister, who's been sailing the area for years. We had an 0945 HW at Weston - then the evening HW at 2150 to get her back on to the river mooring. I'd reckoned the drying height on my river mooring to be 6 m, so with an 11.1 m tide, just on the spring. I calculated on getting back up the Axe at 1900 - and on the mooring by 1940. Just enough time to get her secure, shut down, dingy inflated etc - and back up to the Uphill yard with the last glimmer of daylight. I went down and stayed aboard Sat evening as I had to get the Genoa on the foil - sort out my lifelines and a few other things. The forcast, from the synoptic charts looked to a fine clear day, which we were to get - what I did not quite expect was a NW force 5 - 6 ! We negotiated the lower river Axe ok - I hadn't been down in the dingy but had walked it many times. The channel out from the immediate beach area to open sea was a bit of an unknown - Ian had mostly sailed out of the Bristol Avon, Portishead area, so if was a first to him as well. Being high water on a reasonable tide, once it gets confusing, there is plenty of depth anyway off the main channel. I set in one reef - we had been running aroud the Bay on full main and genoa. The furler by the way works fine - I was a little dubious of it prior to fitting the sail. The internal halyard needs a bit of a tighten - but it was nearly dark the night before when I was fitting it. So out we headed, close hauled, headed to the east of Steep Holm for a starter, then to take it from there what to do for the rest of the day. I'm more than pleased with Lena - she was making five knots very close on the wind, which at first was about 20 knots apparent - into increasingly short steep sea. Past and clear of Steep Holm Ian decided we might go for Barry, where we could gain some shelter in Jasksons Bay, by the docks as a bit of a lunch break. The Bristol Channel is, I suppose, notorious for the predominant westerlies running against some of the fastest tidal streams there are - and we had a spring tide and at one stage between the Holmes, 30 knts on the nasa wind ! Oh yes, and between the Holmes is also one of the faster tidal streams - and we were there just about on the peak of the main ebb flow westwards. Even heeling close to thirty degrees - yes my eye did keep glancing at that compass clino - I had no feel from her that she had any intentions of going any further. The rig seemed fine, tension wise. The new genoa a great shape, the old main a great shape even with a reef in. Ian has a roller boom on his 24 Snapdragon, and was impressed with the shape of my old main with a reef in. A few minor hiccups - my helming, several accidental tacks ! Sheets catching up on where I'd lashed the spin pole - but didn't have any problems with the foresail getting caught up on the babystay, which is common problem with these boats. The high cut on the genoa maybe a help here. Ian took over the helming when things got really rough mid channel - I don't think I could have kept her on the wind through that. I was getting on fine before then - and she seemed able to point ery close to the wind. I'd spent a lot of time delving into a good rig tuning book I have - trying my best to set the mast right with the boat afloat and the appropriate tension on the mains and forestay/backstay. So maybe it paid off. 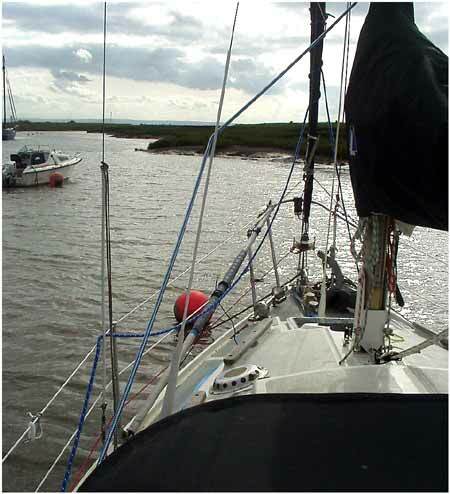 By the time things calmed down a bit and we approached Barry it was myself who was suffering - and getting the anchor down in the bay for an hours rolling around, considering something to eat made things decidedly worse. I tried not to even think of the salami, bacon, brie and olives lurking in my coolbox - I turned down Ian's offer of an apple, settling on some dry bread and tonic water. Needless to say it reappeared pretty quickly. 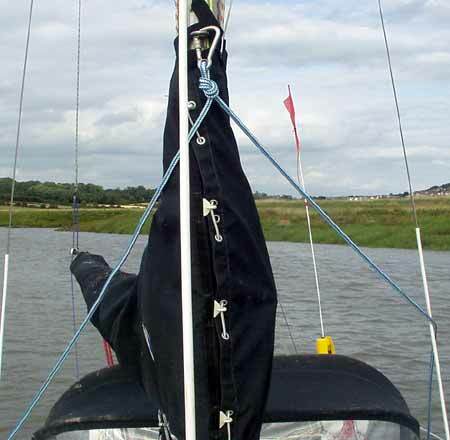 One worrying discovery at Barry was the lower shroud, starboard - which had been the leeward shroud all the way over - was hanging loose with the rigging screw almost to the ends of its threads ! I hadn't locked them off yet until I was happy they were right - and couldn't believe a screw could undo itself that much. Should of at least taped them temporarily. All I can think is the mainsail flapping on a slack leeward shroud caused it gradually undo. I'm glad I had been so fastidious with all the rigging connections at high level - everything split pinned/wired and taped - any shackles moused. It shows that you cannot be too careful. The lowers were not tightened so much as the main shrouds - which I did to 15% break load on a Loos professional gauge. So a quick check of the others, a tighten up and a sigh of relief I happened to use it as a hand hold while up on deck. Lesson learned - lock them off even if you think they might not be quite right. The forestay rigging screw was wired up - given the roller furler mech attached to it. The tensions I originally set though, seem fine - maybe a touch more on the lowers, but the mast seemed good and straight all the way. Really, they just need wiring up ! Ian reckoned on taking it easy back over to Weston Bay, given my green period ! - we had loads of time. We were over to Barry in under three hours. We reefed down to a second reef while motoring out into a steep swell - rather him than me at the time the way I felt - but I did manage to overcome my condition enough to head her into the seas while he was at the mast. We set off back with a partially furled genoa and two reefs. By now though the wind was to the west, and easing - and with the tide slack at about 1600 the seas would settle a bit. (pic- here) must appologise for the state of 2nd reef - its a mess, - the realities of sailing !! Its a shame I felt so rough just at that time as I'm sure we could have come back on full sail, with wind and tide in our favour. That's life - anyway, I gradually recovered thankfully and by the time we had rounded Steep Holm to the SW this time, just north of the one fathom bank N Cardinal - I took the helm again all the way into Weston - now making a pigs ear of holding her downwind, wing on wing - which is a bit of a knack. It didn't matter too much as I could just let her head up a bit. Now after all the stuff mid way coming, this now seemed a doddle - and I felt ok again. I think it worth saying that this was a bank holiday Sunday, gloriously clear and warm - and we did not see a single other boat out all the way except one yacht motoring out on the horizon disappeared back again - and two rod fishing boats close inshore off Barry Dock. We had time to kill now, getting into the bay just before 6 pm - I didn't think the river would be navigable nuch before 7 pm - so we tacked her up and down for a while, eventually furling the genoa and just running on the main with two reefs in. We were still making 3 knts - and there was still about a 2m swell coming in. Despite enjoyably sailing about for a while we had to watch the depth a bit - with little sail up and the tide off Weston Bay running at 4 kts -3 to 4 before HW. Bonked the engine on about quarter to and headed out into deeper water, once I noticed the depth giving us 1.8 in the troughs - with the swell the way it was. Took a visual track for the 'juicy' buoy which marks the start of the channel. I went up on deck to deal with the main. It's what I know well from years of caving - all I really need are new petzls, as the modern ones are anodised - but with a spray of drylube and a wash off in fresh water in the sink after sailing they don't suffer too much. My system for raising the main from the cockpit works a treat - but the method of securing the topping lift from the boom end needs some mods - had a job to release the tension on the 2nd reef ( I've now altered this - so that the clips on the cockpit are themselves secured with a short line, made off to a small horned cleat. That way - if for some reason you cannot get the tension off the line - you can release the end on the cleat. I'm sure there is some form of clip that can be released under tension - but the carbine type spring clips are good because you can clip them one handed to a loose rope eye ( dangling from the end of the boom ) I know, you don't follow a word I'm saying ! Suffice to say, it works, not only for setting/releasing from the boom end, but forming a bridle with the mainsheet to keep the boom fixed - if at the mast on your own. It might have been the fact that the amount of 'lift' I'd set was too small. This is simply adjusted by raising the topping lift at the mast a little. For now it solves the problem - it all needs sorting a bit on a calm day, dried out. I think I shall be taking the her back up on the the Uphill pontoons for a week or two - things are easier to work on there. I'm feeling it may be best to use both - being that the river mooring is costing me basically, nothing - its an option to pay for a berth at the yard and swap between the two as suits my needs. The pontoons at the yard are not extortionate - 200 quarterly inc vat, a bit cheaper if paid annually. Anyway - that said, slowly we nudged our way in - 2.4m - 1.8m, "Hmm", - "Ahh 2.5 now". We gained the main channel markers with 5m at the start of the Axe estuary - about 2.5 as we slowly ran up on idle up to my mooring. About 10 mins too early ! - we just had to touch bottom for a while and with some difficulty managed to moor her facing upstream - not the ideal way when you have secured the bow first with the stream flooding I was politley told. I felt it better to have the boat pulling off of the samson post and over the bow roller on the ebb flow - but maybe I'm wrong on that one. Maybe it doesn't really matter. Anyway - I managed to cover my nicely washed clean boat with Weston mud just about everywhere. I'm going to have to devise some devious method of getting onto the mooring on my tod - especially when coming in on the ebb. I think she floated next to the buoys at 7.30. Just as we were ready to trust that my Susuki 2 was indeed going to start after being on the bracket of Lena all the way to Barry and back, I checked the depth at 3m - at 8.20pm. Lena was shut up, moored up and looking good in the evening light( pic )We cast off and first pull the Suzuki fired up. We could just see ok back down the Axe to the junction to Uphill Pill - by the time we hit terra firma with a soft thud at the Uphill slip it was dark. A memorable first sail in my new boat - many thanks to Ian for trusting a boat he didn't know to those conditions and for the invaluable experience. I learned a great deal today - and more importantly, have gained a great deal of confidence in the boat. give me more, give me more !"